This article is about the media franchise. For the fictional universe upon which it is based, see Fictional universe of Harry Potter. The Wizarding World (previously known as J. K. Rowling's Wizarding World) is a fantasy media franchise and shared fictional universe centred on a series of films, based on the Harry Potter novel series by J. K. Rowling. The films have been in production since 2000, and in that time ten films have been produced—eight are adaptations of the Harry Potter novels and two are part of the Fantastic Beasts series. The films are owned and distributed by Warner Bros. Pictures, and three more are in various stages of production. The series has collectively grossed over $9.1 billion at the global box office, making it the third-highest-grossing film franchise of all-time. David Heyman and his company Heyday Films have produced every film in the Wizarding World. Chris Columbus and Mark Radcliffe served as producers on Harry Potter and the Prisoner of Azkaban, David Barron began producing the films with the 2007 film Harry Potter and the Order of the Phoenix and ending with Harry Potter and the Deathly Hallows – Part 2 in 2011, and Rowling produced the final two films in the Harry Potter series. Heyman, Rowling, Steve Kloves and Lionel Wigram have produced both films in the Fantastic Beasts series. The films are written and directed by several individuals and feature large, often ensemble, casts. Many of the actors, including Daniel Radcliffe, Rupert Grint, Emma Watson and Eddie Redmayne, star in numerous films. Soundtrack albums have been released for each of the films. The franchise also includes a stage production, a digital publication, a video game label and The Wizarding World of Harry Potter–themed areas at several Universal Parks & Resorts amusement parks around the world. The first film in the Wizarding World was Harry Potter and the Philosopher's Stone (2001), which was followed by seven Harry Potter sequels, beginning with Harry Potter and the Chamber of Secrets in 2002, and ending with Harry Potter and the Deathly Hallows – Part 2 in 2011, nearly ten years after the first film's release. Fantastic Beasts and Where to Find Them (2016) is the first film in the spin-off prequel Fantastic Beasts series. A sequel, titled Fantastic Beasts: The Crimes of Grindelwald, has been released in November 2018, while three additional instalments have been announced, including one scheduled for 2020. 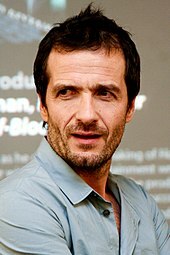 David Heyman has produced every film in the Wizarding World. Harry Potter, a seemingly ordinary eleven-year-old boy, is actually a wizard and survivor of Lord Voldemort's attempted rise to power. Harry is rescued by Rubeus Hagrid from his unkind Muggle relatives (the Dursley's) and takes his place at Hogwarts School of Witchcraft and Wizardry, where he and his friends Ron Weasley and Hermione Granger become entangled in the mystery of the Philosopher's Stone, which is being kept within the school. In October 1998, Warner Bros. purchased the film rights to the first four novels of the Harry Potter fantasy series by J. K. Rowling for a seven-figure sum, after a pitch from producer David Heyman. Warner Bros. took particular notice of Rowling's wishes and thoughts about the films when drafting her contract. One of her principal stipulations was that they be shot in Britain with an all-British cast, which has been generally adhered to. On 8 August 2000, the virtually unknown Daniel Radcliffe and newcomers Rupert Grint and Emma Watson were selected to play Harry Potter, Ron Weasley and Hermione Granger. Chris Columbus was hired to direct the film adaptation of Philosopher's Stone, with Steve Kloves selected to write the screenplay. Filming began on 29 September 2000 at Leavesden Film Studios and concluded on 23 March 2001, with final work being done in July. Principal photography took place on 2 October 2000 at North Yorkshire's Goathland railway station. Warner Bros. had initially planned to release the film over 4 July 2001 weekend, making for such a short production window that several proposed directors removed themselves from consideration. Because of time constraints, the date was put back, and Harry Potter and the Philosopher's Stone was released in the United Kingdom and the United States on 16 November 2001. Harry, Ron, and Hermione return to Hogwarts for their second year, but a mysterious chamber, hidden in the school, is opened leaving students and ghosts petrified by an unknown agent. They must solve the mystery of the chamber, and discover its entrance to find and defeat the true culprit. Columbus and Kloves returned as director, and screenwriter for the film adaptation of Chamber of Secrets. Just three days after the wide release of the first film, production began on 19 November 2001 in Surrey, England, with filming continuing on location on the Isle of Man and at several other locations in Great Britain. Leavesden Film Studios in London made several scenes for Hogwarts. Principal photography concluded in the summer of 2002. The film spent until early October in post-production. Harry Potter and the Chamber of Secrets premiered in the United Kingdom on 3 November 2002 before its wide release on 15 November, one year after the Philosopher's Stone. A mysterious convict, Sirius Black, escapes from Azkaban and sets his sights on Hogwarts, where Dementors are stationed to protect Harry and his peers. Harry learns more about his past and his connection with the escaped prisoner. Professor Lupin teaches Harry an advanced spell to help him. Weasley twins Fred and George give Harry a magical map of Hogwarts (the Marauder's Map), which Harry keeps for the rest of the series. Columbus, the director of the two previous films, decided not to return to helm the third instalment, but remained as a producer alongside Heyman. Warner Bros. then drew up a three-name, short list for Columbus' replacement, which comprised Callie Khouri, Kenneth Branagh (who played Gilderoy Lockhart in Chamber of Secrets) and the eventual director Alfonso Cuarón. Cuarón was initially nervous about accepting the job having not read any of the books, or seen the films, but later signed on after reading the series and connecting immediately with the story. Michael Gambon replaced Richard Harris, who played Albus Dumbledore in the previous two films, after Harris's death in October 2002. Gambon was unconcerned with bettering or copying Harris, instead provided his own interpretation, including using a slight Irish accent for the role. He completed his scenes in three weeks. Gary Oldman was cast in the key role of Sirius Black in February 2003. Principal photography began on 24 February 2003, at Leavesden Film Studios, and concluded in October 2003. Harry Potter and the Prisoner of Azkaban premiered on 23 May 2004 in New York. It was released in the United Kingdom on 31 May, and in the United States on 4 June. It was the first film in the series to be released in both conventional and IMAX theatres. After the Quidditch World Cup, Harry arrives back at Hogwarts and finds himself entered in the Triwizard Tournament, a challenging competition involving completing three dangerous tasks. Harry is forced to compete with three other wizards chosen by the Goblet of Fire – Fleur Delacour, Viktor Krum, and Cedric Diggory. In August 2003, British film director Mike Newell was chosen to direct the film after Prisoner of Azkaban director Alfonso Cuarón announced that he would not direct the sequel. Heyman returned to produce, and Kloves again wrote the screenplay. Principal photography began on 4 May 2004. Scenes involving the film's principal actors began shooting on 25 June 2004 at England's Leavesden Film Studios. Harry Potter and the Goblet of Fire premiered on 6 November 2005 in London, and was released in the United Kingdom and the United States on 18 November. Goblet of Fire was the first film in the series to receive a PG-13 rating by the Motion Picture Association of America (MPAA) for "sequences of fantasy violence and frightening images," M by the Australian Classification Board (ACB), and a 12A by the British Board of Film Classification (BBFC) for its dark themes, fantasy violence, threat and frightening images. David Yates has directed every film in the franchise since Order of the Phoenix. Harry returns for his fifth year at Hogwarts and discovers that the Wizarding World is in denial of Voldemort's return. He takes matters into his own hands and starts a secret organisation to stand up against the regime of Hogwarts' "High Inquisitor" Dolores Umbridge, as well as to learn practical Defence Against the Dark Arts (D.A.D.A) for the forthcoming battle. Daniel Radcliffe confirmed he would return as Harry Potter in May 2005, with Rupert Grint, Emma Watson, Matthew Lewis (Neville Longbottom), and Bonnie Wright (Ginny Weasley) confirmed to return in November 2005. In February 2006, Helen McCrory was cast as Bellatrix Lestrange, but dropped out due to her pregnancy. In May 2006, Helena Bonham Carter was cast in her place. Ralph Fiennes reprises his role as Lord Voldemort. British television director David Yates was chosen to direct the film after Goblet of Fire director Newell, as well as Jean-Pierre Jeunet, Guillermo del Toro, Matthew Vaughn and Mira Nair, turned down offers. Kloves, the screenwriter of the first four Harry Potter films, had other commitments and Michael Goldenberg, who had been considered for screenwriter of the series' first film, filled in to write the script. Principal photography began on 7 February 2006, and concluded at the start of December 2006. Filming was put on a two-month hiatus starting in May 2006 so Radcliffe could sit his A/S Levels and Watson could sit her GCSE exams. Live-action filming took place in England and Scotland for exterior locations and at Leavesden Film Studios for interior locations. Harry Potter and the Order of the Phoenix had its world premiere on 28 June 2007 in Tokyo, Japan, and a UK premiere on 3 July 2007 at the Odeon Leicester Square in London. The film was released in the United Kingdom on 12 July, and the United States on 11 July. Voldemort and his Death Eaters are increasing their terror upon the Wizarding and Muggle worlds. Needing him for an important reason, Headmaster Dumbledore persuades his old friend Horace Slughorn to return to his prior post at Hogwarts. During Slughorn's Potions class, Harry takes possession of a strangely annotated school textbook, previously owned by the "Half-Blood Prince". In July 2007, it was announced that Yates would return as director. Kloves returned to write the screenplay after skipping out of the fifth film, with Heyman and David Barron back as producers. Watson considered not returning for the film, but eventually signed on after Warner Bros. moved the production schedule to accommodate her exam dates. Principal photography began on 24 September 2007, and concluded on 17 May 2008. Though Radcliffe, Gambon and Jim Broadbent (Slughorn) started shooting in late September 2007, other cast members started much later: Watson did not begin until December 2007, Alan Rickman (Severus Snape) until January 2008, and Bonham Carter until February 2008. Harry Potter and the Half-Blood Prince had its world premiere on 6 July 2009 in Tokyo, Japan, and was released in the United Kingdom and the United States on 15 July. Harry, Ron, and Hermione leave Hogwarts behind and set out to find and destroy Lord Voldemort's secret to immortality – the Horcruxes. The trio undergo a long journey with many obstacles in their path including Death Eaters, Snatchers, the mysterious Deathly Hallows, and Harry's connection with the Dark Lord's mind becoming ever stronger. Daniel Radcliffe, Emma Watson and Rupert Grint at the world premiere of Deathly Hallows – Part 2 on 7 July 2011 at Trafalgar Square in London. Originally scheduled for a single theatrical release, on 13 March 2008, Warner Bros. announced that the film adaptation of Deathly Hallows would be split into two parts to do justice to the book and out of respect for its fans. Yates, director of the previous two films, was confirmed to return as director, and Kloves was confirmed as screenwriter. For the first time in the series, Rowling was credited as a producer alongside Heyman and Barron, however Yates noted that her participation in the filmmaking process did not change from the previous films. Pre-production began on 26 January 2009, while principal photography began on 19 February at Leavesden Studios, where the previous six instalments were filmed. Pinewood Studios became the second studio location for shooting the seventh film. The premiere of Harry Potter and the Deathly Hallows – Part 1 was held on 11 November 2010, at the Empire, Leicester Square in London, and the film was released in the United Kingdom and the United States on 19 November. Harry, Ron, and Hermione continue their search to find and destroy the remaining Horcruxes, as Harry prepares for the final battle against Voldemort. The film was announced in March 2008 as Harry Potter and the Deathly Hallows – Part 2, the second of two cinematic parts. It was also revealed that Yates would direct the film and that Kloves would write the screenplay. Kloves started work on the second part's script in April 2009, after the first part's script was completed. Deathly Hallows – Part 2 was filmed back-to-back with Deathly Hallows – Part 1 from 19 February 2009 to 12 June 2010, and treated as if it were one film during principal photography. Reshoots were confirmed to begin in the winter of 2010 for the film's final, and epilogue scenes, which had originally taken place at London King's Cross station. The filming took place at Leavesden Film Studios on 21 December 2010, marking the end of the Harry Potter series after ten years of filming. The film had its world premiere on 7 July 2011 in Trafalgar Square in London, and a U.S. premiere on 11 July at Lincoln Center in New York City. Although filmed in 2D, the film was converted into 3D in post-production and was released in both RealD 3D and IMAX 3D, becoming the first film in the series to be released in this format. The film was released on 15 July in the United Kingdom and the United States. Harry Potter author J. K. Rowling wrote and produced the two films in the Fantastic Beasts series and produced the last two Harry Potter films. In 1926, Newt Scamander arrives in New York City with his magically expanded briefcase which houses a number of dangerous creatures and their habitats. When some creatures escape from his briefcase, Newt must battle to correct the mistake, and the horrors of the resultant increase in violence, fear, and tension felt between magical and non-magical people (No-Maj). On 12 September 2013, Warner Bros. announced that J. K. Rowling was writing a script based on her book Fantastic Beasts and Where to Find Them and the adventures of its fictional author Newt Scamander, set seventy years before the adventures of Harry Potter. The film would mark her screenwriting debut and is planned as the first movie in a new series. According to Rowling, after Warner Bros. suggested an adaptation, she wrote a rough draft of the script in twelve days. She said, "It wasn't a great draft but it did show the shape of how it might look. So that is how it all started." In March 2014, it was revealed that a five-movie series was scheduled with the first instalment set in New York. The film sees the return of producer David Heyman, as well as writer Steve Kloves, both veterans of the Potter film series. In June 2015, Eddie Redmayne was cast in the lead role of Newt Scamander, the Wizarding World's preeminent magizoologist. Other cast members include: Katherine Waterston as Tina Goldstein, Alison Sudol as Queenie Goldstein, Dan Fogler as Jacob Kowalski, Ezra Miller as Credence Barebone, Samantha Morton as Mary Lou Barebone, Jenn Murray as Chastity Barebone, Faith Wood-Blagrove as Modesty Barebone, and Colin Farrell as Percival Graves. Principal photography began on 17 August 2015, at Warner Bros. Studios, Leavesden. After two months, the production moved to St George's Hall in Liverpool, which was transformed into 1920s New York City. Fantastic Beasts and Where to Find Them was released worldwide on 18 November 2016. A few months have passed since the events of Fantastic Beasts and Where to Find Them, Gellert Grindelwald has escaped imprisonment and has begun gathering followers to his cause – elevating wizards above all non-magical beings. Dumbledore must seek help from his former student Newt to put a stop to Grindelwald. The film was announced in March 2014 as the second instalment in the series. In October 2016, it was revealed that Yates and Rowling would return as director, and screenwriter and co-producer, and Redmayne would be returning to play the lead role of Newt Scamander in all the series' films. In November 2016, it was confirmed that Johnny Depp will have a starring role in the sequel, reprising his role as Gellert Grindelwald from the first instalment. Later that same month it was also announced that Albus Dumbledore would be appearing in future instalments, albeit with a younger actor for the prequel film series. In April 2017, it was confirmed that Jude Law had been cast for the role. The second film took place in New York City, the United Kingdom and Paris. Principal photography began on 3 July 2017, at Warner Bros. Studios, Leavesden, and concluded on 20 December 2017. Fantastic Beasts: The Crimes of Grindelwald was released on 16 November 2018. The third instalment was scheduled to be released on 20 November 2020, but the film was replaced by the film adaptation of Dune. Originally scheduled to begin filming in July 2019, production was pushed back to late that autumn to allow more time polishing the script and future of the series. In October 2016, Rowling announced that the Fantastic Beasts film series would be composed of five films. In November 2016, Rowling confirmed that the series' story would consist of a sequence of events that occurred between the years of 1926 and 1945. In December 2013, J. K. Rowling announced that she was working on a Harry Potter–based play, and in June 2015 it was officially titled Harry Potter and the Cursed Child. The two-part, West End stage play, written by British playwright Jack Thorne is based on an original story by Thorne, John Tiffany and Rowling. It is directed by Tiffany with choreography by Steven Hoggett, set design by Christine Jones, costume design by Katrina Lindsay, lighting design by Neil Austin, music by Imogen Heap, and sound design by Gareth Fry. The story begins nineteen years after the events of Deathly Hallows and follows Harry Potter, now a Ministry of Magic employee, and his younger son Albus Severus Potter, who is about to attend Hogwarts. On 20 December 2015, it was announced that Jamie Parker, Noma Dumezweni and Paul Thornley would play Harry Potter, Hermione Granger and Ron Weasley. The play debuted at the Palace Theatre, London on 7 June 2016 in previews, with the official opening on 30 July. The script was released in book form the day after the play's world premiere. The play opened on Broadway at the redesigned Lyric Theatre, New York City on 22 April 2018. Parker, Dumezweni, and Thornley reprised their roles on Broadway with Poppy Miller, Sam Clemmett, Alex Price, and Anthony Boyle also reprising their roles as Ginny Potter, Albus Potter, Draco Malfoy, and Scorpius Malfoy, respectively. This section shows characters who will appear or have appeared in multiple Wizarding World media. An empty, dark grey cell indicates the character was not in the media, or that the character's official presence has not yet been confirmed. ^ Michael Gambon replaced Richard Harris as Dumbledore from Prisoner of Azkaban onwards after Harris's death. ^ Colin Farrell portrays Gellert Grindelwald disguised as Percival Graves in Fantastic Beasts and Where to Find Them, with Johnny Depp briefly portraying the character in the film without his disguise. ^ Newt Scamander's name appeared on the Marauder's Map in the Prisoner of Azkaban film. ^ a b Ian Hart, who played Quirinus Quirrell, provided the voice and motion capture for Voldemort in the Philosopher's Stone film. Richard Bremmer also portrays the character in a flashback sequence in the same film. As of 2018[update], the Wizarding World films have collectively grossed over $9.1 billion at the global box office, making it the third-highest-grossing film franchise of all time behind the Marvel Cinematic Universe films and the Star Wars films. All the films emerged as commercial successes with majority of the film's grossing over $790 million, and all but Prisoner of Azkaban and Fantastic Beasts at some point ranked among the ten highest-grossing films of all time. The Harry Potter films are the highest-grossing series based on a single property, earning over $7.7 billion at the box office; Harry Potter has also generated at least $3.5 billion in home video revenue, taking total consumer spending on the films to over $11 billion. Harry Potter also has a series average of over $1 billion per film when adjusted for inflation. Deathly Hallows – Part 2 grossed over $1.3 billion becoming the third-highest-grossing film of all time, the highest-grossing film in the Wizarding World franchise, and the highest-grossing film of 2011. In the United States and Canada, it set a single-day and opening-weekend record, with $91,071,119 and $169,189,427. In addition, the film set a worldwide opening-weekend record with $483,189,427. Philosopher's Stone and Goblet of Fire were also the highest-grossing films of 2001 and 2005; while Chamber of Secrets, Prisoner of Azkaban, Order of the Phoenix, and Half-Blood Prince were the second highest-grossing films of 2002, 2004, 2007, and 2009. Deathly Hallows – Part 1 was the third-highest-grossing film of 2010, (behind Toy Story 3 and Alice in Wonderland), Fantastic Beasts and Crimes of Grindelwald was the eighth and tenth highest-grossing film of 2016 and 2018 respectively . All the films have been a success commercially and the majority a success critically, making the franchise one of the major Hollywood "tent-poles" akin to James Bond, Star Wars, Indiana Jones, and Pirates of the Caribbean. The Harry Potter series is noted by audiences for growing visually darker and more mature as each film was released. Seven of the ten films were nominated for a total of 14 Academy Awards. Fantastic Beasts and Where to Find Them won for Best Costume Design in 2017, becoming the first film in the Wizarding World to win an Academy Award. Before the win in 2017, the franchise was the most-snubbed, top-grossing franchise of all time at the Academy Awards, with 12 nominations and zero wins. The franchise has earned a total of 32 nominations at the British Academy Film Awards presented at the annual BAFTAs, winning three. At the 64th British Academy Film Awards in February 2011, Rowling, producers Heyman and Barron, along with directors Yates, Newell and Cuarón collected the Michael Balcon Award for Outstanding British Contribution to Cinema in honour of the Harry Potter film series. The Harry Potter series was also recognised by the BAFTA Los Angeles Britannia Awards, with Yates winning the Britannia Award for Artistic Excellence in Directing for his four Harry Potter films. The franchise has received a total of six Grammy Award nominations, all for films in the Harry Potter series. Harry Potter and the Cursed Child garnered eleven Laurence Olivier Awards nominations at the 2017 ceremony, tying the record set in 2008 by Hairspray, and won a record-breaking nine: Best New Play, Best Director, Best Actor (Jamie Parker), Best Actress in a Supporting Role (Noma Dumezweni), Best Actor in a Supporting Role (Anthony Boyle), Best Costume Design, Best Set Design, Best Sound Design, and Best Lighting Design. The London production was also nominated for Best Theatre Choreographer and Outstanding Achievement in Music. Harry Potter and the Cursed Child received ten nominations at the 72nd Tony Awards, winning six awards: Best Play, Best Scenic Design in a Play, Best Costume Design in a Play, Best Lighting Design in a Play, Best Sound Design of a Play, and Best Direction of a Play. The play was also nominated for Best Performance by a Leading Actor in a Play (Parker), Best Performance by a Featured Actor in a Play (Boyle), Best Performance by a Featured Actress in a Play (Dumezweni), and Best Choreography. In June 2011, Rowling launched a new website announcing an upcoming project called Pottermore, where all future Harry Potter projects, and all electronic downloads, would be concentrated. Pottermore opened to the general public on 14 April 2012. Pottermore allows users to be sorted, be chosen by their wand and play various minigames. The main purpose of the website was to allow the user to journey though the story with access to content not revealed by J. K. Rowling previously, with over 18,000 words of information on characters, places and objects in the Harry Potter universe. In September 2015, the website launched a newly designed site containing news, features and articles plus previously unreleased writing by Rowling and removed some features including the interactive Moment illustrations, House Cup and Sorting ceremony. A newly designed Sorting Ceremony was subsequently launched on 28 January 2016 in which users could reclaim their old house or be re-sorted. The Wizarding World of Harry Potter is a chain of themed areas at Universal Parks & Resorts based on the Harry Potter media franchise, adapting elements from the film series and original novels by Rowling. The areas were designed by Universal Creative under an exclusive licence with Warner Bros. Entertainment. It opened on 18 June 2010 as an expansion to the Islands of Adventure theme park at Universal Orlando Resort in Orlando, Florida, and on 8 July 2014 at the Universal Studios Florida theme park. On 15 July 2014, The Wizarding World of Harry Potter opened at the Universal Studios Japan theme park in Osaka, Japan. It includes the village of Hogsmeade, the Harry Potter and the Forbidden Journey ride, and the Flight of the Hippogriff roller coaster. On 7 April 2016, The Wizarding World of Harry Potter opened at the Universal Studios Hollywood theme park near Los Angeles, California. ^ "New logo marks an exciting year ahead for the Wizarding World". Pottermore. 12 March 2018. Archived from the original on 14 March 2018. Retrieved 14 March 2018. ^ Outlaw, Kofi (13 March 2018). "'Fantastic Beasts 2' Trailer Officially Establishes Harry Potter 'Wizarding World' Film Universe". Comic Book. Archived from the original on 14 March 2018. Retrieved 14 March 2018. ^ Gardner, Kelvyn (22 November 2016). "Fantastic Beasts release shows the magic in brand reinvention". Campaign. Archived from the original on 11 June 2017. Retrieved 4 July 2017. ^ "NBCUniversal Acquires Rights To J. K. Rowling's 'Wizarding World' Franchise" (Press release). Comcast Corporation. 8 August 2016. Archived from the original on 20 October 2017. Retrieved 20 October 2017. ^ Gunelius, Susan (2008). Harry Potter: The Story of a Global Business Phenomenon. United Kingdom: Palgrave Macmillan. pp. 24, 65. ISBN 978-0-230-20323-5. Archived from the original on 12 June 2018. ^ "Box Office History for Harry Potter Movies". The Numbers. Archived from the original on 12 June 2018. Retrieved 12 June 2018. ^ a b "J.K. Rowling And Her Magical Cash Cow". Forbes. 3 June 2004. Archived from the original on 5 November 2013. Retrieved 20 October 2017. ^ a b Linder, Bran (28 March 2000). "Chris Columbus to Direct Harry Potter". IGN. Archived from the original on 14 April 2016. Retrieved 8 July 2007. ^ a b c "Chris Columbus COS: full interview". CBBC Newsround. 13 November 2002. Archived from the original on 29 January 2007. Retrieved 10 October 2007. ^ a b c Martin, Denise (17 June 2009). "'Harry Potter' countdown: Steve Kloves on a 'haunting moment' in 'Half-Blood Prince'". Los Angeles Times. Archived from the original on 19 January 2016. Retrieved 14 January 2016. ^ a b Susman, Gary (22 July 2002). "Harry Potter gets a new director". Entertainment Weekly. Archived from the original on 23 November 2015. Retrieved 10 October 2007. ^ a b Susman, Gary (11 August 2003). "Studio confirms Mike Newell will direct Potter IV". Entertainment Weekly. Archived from the original on 20 October 2016. Retrieved 12 October 2012. ^ "David Yates confirms 'Order of the Phoenix' role". HPANA (source: This is Wiltshire). 29 November 2004. Archived from the original on 12 July 2011. Retrieved 4 March 2011. ^ a b "Exclusive Interview: David Yates for "Harry Potter and the Half-Blood Prince"". Dark Horizons. 13 July 2009. Retrieved 4 March 2011. ^ Boucher, Geoff (13 March 2008). "Final 'Harry Potter' book will be split into two movies". Los Angeles Times. Archived from the original on 6 February 2011. Retrieved 4 March 2011. ^ a b Fienberg, Daniel (16 November 2005). "Screenwriter will sit out one Potter". Milwaukee Journal Sentinel. Archived from the original on 2 January 2008. Retrieved 3 March 2008. ^ "Books: Cover Stories At the Frankfurt Book Fair". The Independent. 9 October 1998. Archived from the original on 29 June 2017. Retrieved 9 July 2017. ^ Jensen, Jeff; Fierman, Daniel (14 September 2001). "Harry Potter Comes Alive". Entertainment Weekly. Archived from the original on 11 May 2017. Retrieved 6 July 2017. ^ Treneman, Ann (30 June 2000). "J.K. Rowling, the interview". The Times. Archived from the original on 3 February 2007. Retrieved 7 July 2017. ^ a b c d "Daniel Radcliffe, Rupert Grint and Emma Watson Bring Harry, Ron and Hermione to Life for Warner Bros. Pictures Harry Potter and the Sorcerer's Stone". Warner Bros. 21 August 2000. Archived from the original on 4 April 2007. Retrieved 26 May 2007. ^ Sragow, Michael (24 February 2000). "A Wizard of Hollywood". Salon.com. Archived from the original on 10 July 2007. Retrieved 8 July 2007. ^ "Harry Potter and the Sorcerer's Stone misc notes". Turner Classic Movies. Archived from the original on 7 January 2016. Retrieved 21 October 2015. ^ a b c "Harry Potter at Leavesden". WB Studio Tour. Archived from the original on 25 February 2012. Retrieved 16 September 2012. ^ Schmitz, Greg Dean. "Harry Potter and the Sorcerer's Stone (2001)". Yahoo! Movies. Archived from the original on 15 December 2007. Retrieved 9 August 2008. ^ Linder, Brian (2 October 2000). "Potter Pics: Hagrid, Hogsmeade Station, and the Hogwarts Express". IGN. Archived from the original on 31 August 2011. Retrieved 9 July 2007. ^ "Harry Potter Filming Locations". USA Today. 18 November 2001. Archived from the original on 14 July 2017. Retrieved 23 September 2012. ^ a b "Harry Potter and the Chamber of Secrets – Greg's Preview. Yahoo! Movies". Yahoo!. Archived from the original on 21 June 2007. ^ "Harry Potter Filming Locations". Gloucestershire on Screen. Archived from the original on 4 March 2012. ^ "Potter film should be finished next week". CBBC Newsround. 4 October 2002. Archived from the original on 13 March 2014. Retrieved 16 October 2012. ^ "Warner Bros. Online To Webcast World Premiere Of "Harry Potter And The Chamber Of Secrets" Live From London". Warner Bros. Pictures. 31 October 2002. Archived from the original on 14 July 2017. Retrieved 6 July 2017. ^ a b "Harry Potter Movies at the Box Office". Box Office Mojo. Archived from the original on 30 June 2017. Retrieved 4 July 2017. ^ a b Dickey, Lucinda. "The creators of Harry Potter break out of character to discuss The Prisoner of Azkaban". Science Fiction Weekly. Archived from the original on 15 June 2004. Retrieved 10 October 2007. ^ "Alfonso Cuaron: the man behind the magic". CBBC Newsround. 24 May 2004. Archived from the original on 7 November 2007. Retrieved 10 October 2007. ^ a b Jensen, Jeff (28 October 2005). "Potter movie producer reflects on the franchise". Entertainment Weekly. Archived from the original on 29 November 2015. Retrieved 4 November 2005. ^ "Actor Richard Harris dies". BBC News. 25 October 2002. Archived from the original on 6 December 2002. Retrieved 10 October 2007. ^ Synnot, Siobhan (30 May 2004). "Olivier, Dumbledore and two broken ribs". The Scotsman. Archived from the original on 25 May 2007. Retrieved 30 November 2007. ^ a b "Dumbledore and Sirius cast for Azkaban". CBBC Newsround. 21 February 2003. Archived from the original on 8 August 2007. Retrieved 10 October 2007. ^ Schmitz, Greg Dean. "Harry Potter and the Prisoner of Azkaban (2004)". Yahoo! Movies. Archived from the original on 16 July 2007. Retrieved 10 October 2007. 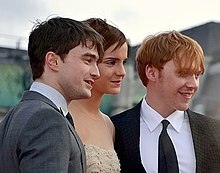 ^ "Potter star mobbed at US premiere". BBC News. 24 May 2004. Archived from the original on 8 October 2013. Retrieved 17 October 2012. ^ "Potter 3 will be screened on IMAX". CBBC Newsround. 19 December 2003. Archived from the original on 3 April 2015. Retrieved 17 October 2012. ^ "Harry Potter at Leavesden". Warner Bros. Pictures. 2011. Archived from the original on 26 July 2014. Retrieved 13 October 2012. ^ Silverman, Stephen (5 August 2004). "Ralph Fiennes Ready to Scare Harry Potter". People. Archived from the original on 14 July 2017. Retrieved 6 July 2017. ^ Murray, Rebecca (25 June 2004). ""Harry Potter and the Goblet of Fire" Production News". About.com. Archived from the original on 22 September 2005. Retrieved 12 October 2012. ^ "'Harry Potter' cast attends London premiere". USA Today. 6 November 2005. Archived from the original on 22 September 2005. Retrieved 6 July 2017. ^ "Potter film to get Imax release". BBC News. 3 May 2005. Archived from the original on 11 July 2017. Retrieved 6 July 2017. ^ "Potter Grows Up and 'Goblet of Fire' is PG-13". ComingSoon.net. 9 August 2005. Archived from the original on 14 July 2017. Retrieved 6 July 2017. ^ "Harry Potter (4) and the Goblet of Fire". Raising Children Network. Archived from the original on 21 February 2016. Retrieved 6 July 2017. ^ "How Goblet of Fire got its 12A rating". CBBC Newsround. Archived from the original on 16 April 2016. Retrieved 6 July 2017. ^ "Official "Harry Potter and the Order of the Phoenix" Logo". The Leaky Cauldron. 5 October 2006. Retrieved 6 July 2017. ^ Puig, Claudia (3 May 2005). "There's no looking back". USA Today. Archived from the original on 29 June 2011. Retrieved 6 July 2017. ^ "NR chats to GOF's Rupert Grint". CBBC Newsround. 16 November 2005. Archived from the original on 6 June 2017. Retrieved 6 July 2017. ^ "NR chats to GOF's Emma Watson". CBBC Newsround. 16 November 2005. Archived from the original on 19 September 2016. Retrieved 6 July 2017. ^ Linn, Laura; Morreale, Marie (26 November 2005). "Bonnie Wright as Ginny Weasley in Harry Potter and the Goblet of Fire". Scholastic News. Archived from the original on 10 July 2017. Retrieved 6 July 2017. ^ "Luna Lovegood role has been cast". CBBC Newsround. 2 February 2006. Archived from the original on 8 February 2017. Retrieved 6 July 2017. ^ a b "Potter exclusive: New Bellatrix". CBBC Newsround. 25 May 2006. Archived from the original on 5 December 2016. Retrieved 6 July 2017. ^ Daly, Steve (13 July 2007). "On-set secrets from the darkest Harry movie yet". Entertainment Weekly. Archived from the original on 27 October 2016. Retrieved 6 July 2017. ^ Raphael, Amy (24 June 2007). "How I raised Potter's bar". The Observer. London. Archived from the original on 25 December 2013. Retrieved 26 June 2007. ^ "Order of the Phoenix Movie Rehearsals Starting". The Leaky Cauldron. 27 January 2006. Archived from the original on 24 July 2007. Retrieved 30 December 2006. ^ "2006: The Year in Harry Potter Film". The Leaky Cauldron. 29 December 2006. Archived from the original on 27 September 2007. Retrieved 30 December 2006. ^ "Exclusive: Order of the Phoenix News". Empire. 14 March 2006. Archived from the original on 7 January 2016. Retrieved 2 August 2007. ^ "New Privet Drive Set Photos from OotP". The Leaky Cauldron. 4 July 2006. Archived from the original on 24 July 2007. Retrieved 24 February 2007. ^ "Japanese debut for Potter movie". CBBC Newsround. 22 May 2007. Archived from the original on 13 July 2007. Retrieved 6 July 2017. ^ "Fans brave rain for Potter stars". CBBC Newsround. 3 July 2007. Archived from the original on 2 July 2016. Retrieved 6 July 2017. ^ "Change to UK "OotP" Date: Now 12 July". The Leaky Cauldron. 11 May 2007. Archived from the original on 6 March 2016. Retrieved 6 July 2017. ^ "Confirmed: Change to US "Order of the Phoenix" Release Date, Now 11 July". The Leaky Cauldron. 29 May 2007. Archived from the original on 14 June 2016. Retrieved 6 July 2017. ^ "Description & first official picture from 'Half-Blood Prince'". HPANA. 14 December 2017. Archived from the original on 24 March 2016. Retrieved 6 July 2017. ^ a b c "Casting Is Complete on "Harry Potter and the Half-Blood Prince"" (Press release). Warner Bros. Pictures. PR Newswire. Archived from the original on 3 April 2017. Retrieved 6 July 2017. ^ Stax (26 September 2006). "Hermione Gets Cold Feet". IGN. Archived from the original on 19 March 2016. Retrieved 6 July 2017. ^ Ditzian, Eric (16 November 2010). "Emma Watson Recalls Nearly Quitting 'Harry Potter'". MTV News. Archived from the original on 22 February 2017. Retrieved 6 July 2017. ^ ""Half-Blood Prince" Filming News: Threat of Strike to Affect Harry Potter Six?". The Leaky Cauldron. 19 September 2007. Archived from the original on 23 March 2016. Retrieved 6 July 2017. ^ "Filming for "Half-Blood Prince" Completed". The Leaky Cauldron. 22 May 2008. Archived from the original on 7 October 2016. Retrieved 6 July 2017. ^ ""Half-Blood Prince" Filming Updates with Emma Watson, Alan Rickman News". The Leaky Cauldron. 28 November 2007. Archived from the original on 19 March 2016. Retrieved 27 January 2008. ^ Duke, Andy; Stephanie Sanchez (26 November 2007). "Interviews: Depp, Burton, Carter and Rickman Slash Through Sweeney Todd!". Archived from the original on 9 February 2008. Retrieved 27 January 2008. ^ Otagaki, Yumi (6 July 2009). "Tokyo premiere launches return of "Harry Potter"". Reuters. Archived from the original on 14 July 2017. Retrieved 7 July 2017. ^ "Official Release Dates". Warner Bros. Pictures. Archived from the original on 3 January 2010. Retrieved 7 November 2010. ^ "Harry Potter and the Deathly Hallows Trailer Online Monday". ComingSoon.net. 23 June 2010. Archived from the original on 26 June 2010. Retrieved 5 July 2017. ^ a b "Warner Bros. Plans Two-Part Film Adaptation of "Harry Potter and the Deathly Hallows" to Be Directed by David Yates" (Press release). Warner Bros. Pictures. Business Wire. 13 March 2008. Archived from the original on 28 June 2017. Retrieved 6 September 2012. ...expand the screen adaptation of Harry Potter and the Deathly Hallows and release the film in two parts. ^ "David Yates discusses 'Harry Potter and the Deathly Hallows – Part 2'". Manila Bulletin Publishing Corporation. 14 June 2011. Archived from the original on 10 September 2012. Retrieved 20 June 2011. ^ "Emma reveals DH test shooting begins this Monday". MuggleNet. 20 January 2009. Archived from the original on 13 April 2010. Retrieved 14 February 2009. ^ "Harry Potter Movies Being Filmed at Leavesden and Pinewood Studios". The Leaky Cauldron. 25 March 2009. Archived from the original on 28 March 2009. Retrieved 26 March 2009. ^ ""Deathly Hallows: Part 1" US and UK Premiere Dates and Locations Announced". The Leaky Cauldron. 3 November 2010. Archived from the original on 7 November 2010. Retrieved 24 January 2011. ^ "Harry Potter and the Deathly Hallows (Part 2): Synopsis". HBO. Archived from the original on 3 January 2017. Retrieved 6 July 2017. ^ Helen O'Hara (April 2009). "Hallowed Ground". Empire: 100–104. ^ Malvern, Jack (14 March 2008). "Longer spell at box office for Harry Potter". The Times. UK. ^ Schwartz, Terri (14 June 2010). "'Harry Potter' Filming Wraps – For The Last Time". MTV News. Archived from the original on 26 September 2011. Retrieved 6 December 2012. ^ Richards, Olly (14 March 2008). "Potter Producer Talks Deathly Hallows". Empire. Archived from the original on 10 July 2011. Retrieved 14 March 2008. ^ Goldman, Eric (21 December 2012). "Harry Potter Reshoots Underway". IGN. Archived from the original on 22 September 2012. Retrieved 6 December 2012. ^ Ellwood, Gregory (11 November 2010). "Daniel Radcliffe and Emma Watson confirm 'Harry Potter and the Deathly Hallows, Pt 2' ending reshoots". Hitfix. Archived from the original on 26 March 2016. Retrieved 7 July 2017. ^ a b SchwartPhillips, jevon (1 March 2011). "World premiere for Harry Potter and the Deathly Hallows – Part 2 set for July 7". Los Angeles Times. Archived from the original on 25 October 2013. Retrieved 2 March 2011. ^ Derschowitz, Jessica (12 July 2011). ""Harry Potter and the Deathly Hallows: Part 2" premieres in New York". CBS News. Archived from the original on 28 September 2015. Retrieved 6 December 2012. ^ Vlessing, Etan (13 July 2011). "'Harry Potter' Film To Bow On Record 423 Global Imax Screens". The Hollywood Reporter. Archived from the original on 13 September 2011. Retrieved 3 November 2012. ^ Tyler, Josh (29 May 2012). "Harry Potter Fans Choosing 2D Over 3D For Deathly Hallows 2". Cinema Blend. Archived from the original on 13 May 2016. Retrieved 7 July 2017. ^ Armitage, Hugh; Fletcher, Rosie (16 November 2018). "Fantastic Beasts 2, 3, 4 and 5 release date, cast, plot and all you need to know". Digital Spy. ^ Nancy Tartagloine (12 September 2013). "Warner Bros, J.K. Rowling Team For New 'Harry Potter'-Inspired Film Series". Deadline Hollywood. Archived from the original on 13 September 2013. Retrieved 12 September 2013. ^ a b c Barraclough, Leo (3 August 2016). "'Fantastic Beasts' Sequel in the Works With J.K. Rowling and David Yates, Release Date Set". Variety. Archived from the original on 5 November 2016. Retrieved 9 November 2016. ^ a b Barraclough, Leo (15 December 2015). "'Fantastic Beasts and Where to Find Them' First Trailer Arrives". Variety. Archived from the original on 18 June 2018. Retrieved 18 June 2018. ^ D'Alessandro, Anthony; D'Alessandro, Anthony (18 January 2019). "'Fantastic Beasts 3' Pushes Production Start To Late Fall". ^ Hibberd, James (4 November 2015). "'Fantastic Beasts' plot unveiled: Here's what the movie's about". Entertainment Weekly. Archived from the original on 17 February 2017. Retrieved 5 July 2017. ^ "Warner Bros. Announces Expanded Creative Partnership with J.K. Rowling". Business Wire. Archived from the original on 15 September 2013. Retrieved 12 September 2013. ^ "J.K. Rowling wrote the 'Fantastic Beasts' rough draft in twelve days, wants to be an extra in drag". Hypable. 7 February 2014. Archived from the original on 9 February 2014. Retrieved 8 February 2014. ^ a b Barnes, Brooks (29 March 2014). "Warner's C.E.O. Is Bullish on the Big Screen". The New York Times. Archived from the original on 29 March 2014. Retrieved 29 March 2014. ^ Smith, Grady (2 October 2013). "'Harry Potter' producer David Heyman talks 'Fantastic Beasts' spinoff". Entertainment Weekly. Archived from the original on 18 June 2018. Retrieved 18 June 2018. ^ a b Graeme McMillan (1 June 2015). "Eddie Redmayne Officially Cast in 'Harry Potter' Prequel 'Fantastic Beasts and Where to Find Them'". The Hollywood Reporter. Archived from the original on 3 June 2015. Retrieved 2 June 2015. ^ Osorio, Paulette (17 August 2015). "Filming Gets Underway on 'Fantastic Beasts and Where to Find Them'" (Press release). Warner Bros. Pictures. Business Wire. Archived from the original on 7 October 2016. ^ "David Yates-Helmed 'Fantastic Beast' Filming Starts Up". Deadline Hollywood. 17 August 2015. Archived from the original on 18 August 2015. Retrieved 17 August 2015. ^ Miles, Tina (20 October 2015). "Fake snow on Harry Potter prequelset as Liverpool filming makes progress". Liverpool Echo. Archived from the original on 22 October 2015. Retrieved 21 October 2015. ^ "Harry Potter Spinoff 'Fantastic Beasts' to Hit Theaters Nov. 18, 2016". Variety. 13 May 2014. Archived from the original on 18 May 2014. Retrieved 19 May 2014. ^ a b Tartaglione, Nancy (3 July 2017). "'Fantastic Beasts' Sequel Reveals Plot Details, Adds Cast As Shooting Starts". Deadline Hollywood. Archived from the original on 4 July 2017. Retrieved 3 July 2017. ^ a b McNary, Dave; Khatchatourian, Maane (13 October 2016). "'Fantastic Beasts and Where to Find Them' to Be Five-Film Franchise". Variety. Archived from the original on 29 October 2016. Retrieved 2 November 2016. ^ a b Chitwood, Adam (8 November 2016). "'Fantastic Beasts 2': Johnny Depp Confirmed as Grindelwald; Setting Revealed". Collider. Archived from the original on 9 November 2016. Retrieved 9 November 2016. ^ "Johnny Depp is Grindelwald and More on Fantastic Beasts". ComingSoon.net. 8 November 2016. Archived from the original on 9 November 2016. ^ a b "'Jude Law cast as Albus Dumbledore in next Fantastic Beasts film'". Pottermore. 12 April 2017. Archived from the original on 12 April 2017. Retrieved 12 April 2017. ^ Wood, Matt (19 November 2016). "Fantastic Beasts and Where to Find Them 2 takes place in Paris". Cinema Blend. Archived from the original on 20 November 2016. Retrieved 19 November 2016. ^ Chitwood, Adam (20 December 2017). "'Fantastic Beasts: The Crimes of Grindelwald' Wraps Filming". Collider. Archived from the original on 20 December 2017. Retrieved 20 December 2017. ^ Barraclough, Leo (3 August 2016). "'Fantastic Beasts' Sequel in the Works With J.K. Rowling and David Yates, Release Date Set". Variety. Archived from the original on 5 November 2016. Retrieved 2 November 2016. ^ Lieberman, David (15 October 2014). "Warner Bros' Kevin Tsujihara Outlines Major Film & TV Push Amid Cost Cuts: Time Warner Investor Day". Deadline Hollywood. Archived from the original on 9 November 2016. Retrieved 9 November 2016. ^ D'Alessandro, Anthony (18 January 2018). "'Fantastic Beasts 3' Pushes Production Start To Late Fall". Deadline Hollywood. Retrieved 18 January 2019. ^ Logan, Megan (21 November 2016). "J.K. Rowling Just Confirmed 'Fantastic Beasts' Will End in WWII". Inverse. Archived from the original on 9 November 2016. Retrieved 20 October 2017. ^ "J.K. Rowling to produce Harry Potter stage play". USA Today. 20 December 2013. Archived from the original on 10 July 2017. Retrieved 22 December 2013. ^ "Harry Potter and the Cursed Child to open in 2016". BBC News. 26 June 2015. Archived from the original on 26 June 2015. Retrieved 26 June 2015. ^ "About The Show". Harry Potter The Play. Palace Theatre. 23 October 2015. Archived from the original on 14 July 2017. Retrieved 23 October 2015. ^ "In New Play, Harry Potter Is a Father". The New York Times. 23 October 2015. Archived from the original on 30 October 2015. Retrieved 9 July 2017. ^ a b c d "Harry Potter and the Cursed Child announces lead cast". BBC News. 21 December 2015. Archived from the original on 21 December 2015. Retrieved 21 December 2015. ^ Lyall, Sarah (7 June 2016). "'Harry Potter and the Cursed Child' Begins Previews in London, as Magic Continues". The New York Times. Archived from the original on 10 April 2017. Retrieved 9 July 2017. ^ Begley, Sarah (10 February 2016). "Harry Potter and The Cursed Child Will Be Published In Book Form". Time. Archived from the original on 1 May 2017. Retrieved 9 July 2017. ^ Gerard, Jeremy (4 May 2017). "'Harry Potter And The Cursed Child' Sets April 22, 2018 Broadway Opening". Deadline Hollywood. Archived from the original on 4 May 2017. Retrieved 4 May 2017. ^ a b c d e f g h Gerard, Jeremy (2 August 2017). "'Harry Potter And The Cursed Child' Broadway Cast Announced". Deadline Hollywood. Archived from the original on 3 August 2017. Retrieved 3 August 2017. ^ a b c d e f g h i j k l m n o p q r s t u v w x y Bundel, Ani (2 August 2016). "A Full Breakdown of the Cursed Child Cast". Wizards And Whatnot. FanSided. Archived from the original on 13 November 2016. Retrieved 14 July 2017. ^ a b c d "Harry Potter and the Goblet of Fire – Full Cast and Credits". Hollywood.com. Archived from the original on 14 July 2017. Retrieved 14 July 2017. ^ a b c d "Harry Potter and the Sorcerer's Stone – Full Cast and Credits". Hollywood.com. Archived from the original on 23 January 2016. Retrieved 14 July 2017. ^ a b c d e f g h i j k l m n "Harry Potter and the Deathly Hallows: Part 2 – Full Cast and Credits". Hollywood.com. Archived from the original on 24 January 2016. Retrieved 14 July 2017. ^ "Deathly Hallows Casting Updates: Teen Dumbledore Cast, Chris Rankin Returns (Updated)". The Leaky Cauldron. 31 May 2009. Archived from the original on 10 July 2017. Retrieved 16 July 2017. ^ a b "11 intriguing moments from the third Fantastic Beasts: The Crimes of Grindelwald trailer". Pottermore. 25 September 2018. Archived from the original on 26 September 2018. Retrieved 26 September 2018. ^ "Harry Potter and the Deathly Hallows: Part 1 – Full Cast and Credits". Hollywood.com. Archived from the original on 14 July 2017. Retrieved 14 July 2017. ^ "Jamie Campbell Bower Talks Role as Young Grindelwald in Deathly Hallows". The Leaky Cauldron. 30 June 2009. Archived from the original on 22 March 2016. Retrieved 16 July 2017. ^ Ford, Rebecca (5 August 2015). "Colin Farrell Joins Harry Potter Spinoff 'Fantastic Beasts' (Exclusive)". The Hollywood Reporter. Archived from the original on 7 November 2017. Retrieved 7 November 2017. ^ McCluskey, Megan (18 November 2016). "Where Does the Fantastic Beasts Franchise Go Next?". Time. Archived from the original on 7 November 2017. Retrieved 7 November 2017. ^ Moore, Sam (5 November 2018). "Professor McGonagall's introduction in Fantastic Beasts 2 will break Harry Potter canon". Metro. Retrieved 18 November 2018. ^ Hibberd, James (25 September 2018). "Fantastic Beasts actress Claudia Kim breaks silence on playing Nagini". Entertainment Weekly. Archived from the original on 29 October 2018. Retrieved 29 October 2018. ^ Lord, Emma (28 November 2016). "Newt Scamander Was On The Marauder's Map In A 'Harry Potter' Film — Here's Why He Might Have Been There". Bustle. Archived from the original on 14 July 2017. Retrieved 14 July 2017. ^ Hibberd, James (12 July 2018). "First look at Young Newt in Fantastic Beasts: The Crimes of Grindelwald". Entertainment Weekly. Archived from the original on 12 July 2018. Retrieved 12 July 2018. ^ "Top actress "will play Umbridge"". CBBC Newsround. 21 October 2005. Archived from the original on 5 March 2016. Retrieved 14 July 2017. ^ O'Regan, Jack (26 March 2017). "Voldemort's Hidden Backstory In Harry Potter". Screen Rant. Archived from the original on 14 July 2017. Retrieved 14 July 2017. ^ "New face to battle Potter". BBC News. 4 March 2002. Archived from the original on 8 April 2012. Retrieved 16 July 2017. ^ a b "Franchise Index". Box Office Mojo. Archived from the original on 24 May 2014. Retrieved 31 January 2019. ^ Nash, Bruce (21 July 2011). "Analysis: Harry Potter and the Big Pile of Money". The Numbers. Nash Information Services, LLC. Archived from the original on 29 September 2013. Retrieved 7 September 2013. ^ The Economist online (11 July 2011). "Pottering on, and on". The Economist. Archived from the original on 3 March 2017. Retrieved 4 January 2012. ^ "2011 Worldwide Grosses". Box Office Mojo. Archived from the original on 9 June 2016. Retrieved 14 July 2017. ^ Gray, Brandon (16 July 2011). "Friday Report: Harry Potter Conjures Opening Day Record". Box Office Mojo. Archived from the original on 19 July 2011. Retrieved 18 July 2011. ^ McClintock, Pamela (17 July 2011). "Box Office Report: Harry Potter Grosses All-Time Domestic Best of $168.6 Million". The Hollywood Reporter. Archived from the original on 17 July 2011. Retrieved 18 July 2011. ^ McClintock, Pamela (17 July 2011). "Box Office Report: Harry Potter Nabs a Record-Breaking $476 Mil in Worldwide Debut". The Hollywood Reporter. Archived from the original on 19 July 2011. Retrieved 19 July 2011. ^ "Harry Potter and the Deathly Hallows – Part 2". The Numbers. 2011. Archived from the original on 18 October 2012. Retrieved 3 November 2012. ^ "2001 Worldwide Grosses". Box Office Mojo. Archived from the original on 2 July 2017. Retrieved 14 July 2017. ^ "2005 Worldwide Grosses". Box Office Mojo. Archived from the original on 2 July 2017. Retrieved 14 July 2017. ^ "2002 Worldwide Grosses". Box Office Mojo. Archived from the original on 24 June 2017. Retrieved 14 July 2017. ^ "2004 Worldwide Grosses". Box Office Mojo. Archived from the original on 7 July 2017. Retrieved 14 July 2017. ^ "2007 Worldwide Grosses". Box Office Mojo. Archived from the original on 8 May 2013. Retrieved 14 July 2017. ^ "2009 Worldwide Grosses". Box Office Mojo. Archived from the original on 9 February 2010. Retrieved 14 July 2017. ^ "2010 Worldwide Grosses". Box Office Mojo. Archived from the original on 22 February 2017. Retrieved 14 July 2017. ^ "2016 Worldwide Grosses". Box Office Mojo. Archived from the original on 6 June 2017. Retrieved 14 July 2017. ^ "Harry Potter and the Sorcerer's Stone (2001)". Box Office Mojo. Archived from the original on 11 February 2009. Retrieved 31 January 2019. ^ "Harry Potter and the Chamber of Secrets (2002)". Box Office Mojo. Archived from the original on 11 February 2009. Retrieved 31 January 2019. ^ "Harry Potter and the Prisoner of Azkaban (2004)". Box Office Mojo. Archived from the original on 12 February 2009. Retrieved 31 January 2019. ^ "Harry Potter and the Goblet of Fire (2005)". Box Office Mojo. Archived from the original on 22 January 2009. Retrieved 31 January 2019. ^ "Harry Potter and the Order of the Phoenix (2007)". Box Office Mojo. Archived from the original on 1 February 2009. Retrieved 31 January 2019. ^ "Harry Potter and the Half-Blood Prince (2009)". Box Office Mojo. Archived from the original on 24 December 2009. Retrieved 31 January 2019. ^ "Harry Potter and the Deathly Hallows Part 1 (2010)". Box Office Mojo. Archived from the original on 30 June 2017. Retrieved 31 January 2019. ^ "Harry Potter and the Deathly Hallows Part 2 (2011)". Box Office Mojo. Archived from the original on 26 June 2017. Retrieved 31 January 2019. ^ "Fantastic Beasts and Where to Find Them (2016)". Box Office Mojo. Archived from the original on 24 June 2017. Retrieved 31 January 2019. ^ "Fantastic Beasts: The Crimes of Grindelwald (2018)". Box Office Mojo. Retrieved 31 January 2019. ^ "J.K. Rowling's Wizarding World Movies at the Box Office". Box Office Mojo. Archived from the original on 30 June 2017. Retrieved 31 January 2019. ^ "Harry Potter Films Get Darker and Darker". The Wall Street Journal. 18 November 2010. Archived from the original on 22 June 2012. Retrieved 9 September 2012. ^ "Harry Potter: Darker, Richer and All Grown Up". Time. 15 July 2009. Archived from the original on 10 October 2012. Retrieved 9 September 2012. ^ "Review: "Harry Potter" goes out with magical, and dark, bang". Reuters. 6 July 2011. Archived from the original on 2 July 2013. Retrieved 9 September 2012. ^ "Harry Potter and the Sorcerer's Stone (2001)". Rotten Tomatoes. Archived from the original on 3 December 2013. Retrieved 14 November 2018. ^ "Harry Potter and the Sorcerer's Stone (2001): Reviews". Metacritic. Archived from the original on 11 July 2009. Retrieved 14 November 2018. ^ a b c d e f g h i j "Cinemascore". CinemaScore. Archived from the original on 19 January 2015. Retrieved 21 February 2015. ^ "Harry Potter and the Chamber of Secrets (2002)". Rotten Tomatoes. Archived from the original on 23 November 2013. Retrieved 22 March 2019. ^ "Harry Potter and the Chamber of Secrets (2002): Reviews". Metacritic. Archived from the original on 11 July 2009. Retrieved 14 November 2018. ^ "Harry Potter and the Prisoner of Azkaban (2004)". Rotten Tomatoes. Archived from the original on 28 September 2013. Retrieved 14 November 2018. ^ "Harry Potter and the Prisoner of Azkaban (2004): Reviews". Metacritic. Archived from the original on 15 June 2009. Retrieved 29 June 2009. ^ "Harry Potter and the Goblet of Fire (2005)". Rotten Tomatoes. Archived from the original on 16 December 2013. Retrieved 22 March 2019. ^ "Harry Potter and the Goblet of Fire (2005): Reviews". Metacritic. Archived from the original on 13 July 2009. Retrieved 14 November 2018. ^ "Harry Potter and the Order of the Phoenix (2007)". Rotten Tomatoes. Archived from the original on 14 June 2016. Retrieved 22 March 2019. ^ "Harry Potter and the Order of the Phoenix (2007): Reviews". Metacritic. Archived from the original on 13 July 2009. Retrieved 14 November 2018. ^ "Harry Potter and the Half-Blood Prince (2009)". Rotten Tomatoes. Archived from the original on 9 July 2016. Retrieved 22 March 2019. ^ "Harry Potter and the Half-Blood Prince (2009): Reviews". Metacritic. Archived from the original on 27 May 2009. Retrieved 14 November 2018. ^ "Harry Potter and the Deathly Hallows – Part 1 (2010)". Rotten Tomatoes. Archived from the original on 1 December 2013. Retrieved 22 March 2019. ^ "Harry Potter and the Deathly Hallows: Part I (2010): Reviews". Metacritic. Archived from the original on 19 November 2010. Retrieved 14 November 2018. ^ "Harry Potter and the Deathly Hallows – Part 2 (2011)". Rotten Tomatoes. Archived from the original on 9 July 2016. Retrieved 22 March 2019. ^ "Harry Potter and the Deathly Hallows: Part 2 (2011): Reviews". Metacritic. Archived from the original on 18 July 2011. Retrieved 14 November 2018. ^ "Fantastic Beasts and Where to Find Them (2016)". Rotten Tomatoes. Archived from the original on 6 June 2017. Retrieved 22 March 2019. ^ "Fantastic Beasts and Where to Find Them reviews". Metacritic. Archived from the original on 28 November 2016. Retrieved 14 November 2018. ^ "Fantastic Beasts: The Crimes of Grindelwald (2016)". Rotten Tomatoes. Retrieved 13 December 2018. ^ "Fantastic Beasts: The Crimes of Grindelwald reviews". Metacritic. Retrieved 16 November 2018. ^ Dornbush, Jonathon (26 February 2017). "Oscars 2017: Fantastic Beasts Wins First Academy Award for Harry Potter Franchise". IGN. Archived from the original on 27 February 2017. Retrieved 27 February 2017. ^ Ryan, Joal (27 February 2012). "Thanks, Academy: Oscars Make Harry Potter Most-Snubbed Franchise of All-Time". E! Online. Archived from the original on 3 March 2016. Retrieved 5 July 2017. ^ a b c "The 74th Academy Awards (2002) Nominees and Winners". Academy of Motion Picture Arts and Sciences (AMPAS). Archived from the original on 9 November 2014. Retrieved 19 November 2011. ^ a b "The 77th Academy Awards (2005) Nominees and Winners". Academy of Motion Picture Arts and Sciences (AMPAS). Archived from the original on 1 January 2016. Retrieved 25 January 2015. ^ "The 78th Academy Awards (2006) Nominees and Winners". Academy of Motion Picture Arts and Sciences (AMPAS). Archived from the original on 9 November 2014. Retrieved 20 November 2011. ^ "The 82nd Academy Awards (2010) Nominees and Winners". Academy of Motion Picture Arts and Sciences (AMPAS). Archived from the original on 30 November 2014. Retrieved 10 November 2011. ^ a b "The 83rd Academy Awards (2011) Nominees and Winners". Academy of Motion Picture Arts and Sciences (AMPAS). Archived from the original on 26 May 2011. Retrieved 11 November 2011. ^ a b c "The 84th Academy Awards (2012) Nominees and Winners". Academy of Motion Picture Arts and Sciences (AMPAS). Archived from the original on 15 October 2014. Retrieved 26 April 2012. ^ a b "The 89th Academy Awards (2017) Nominees and Winners". Academy of Motion Picture Arts and Sciences (AMPAS). Archived from the original on 27 February 2017. Retrieved 26 February 2017. ^ "Harry Potter franchise to get Outstanding BAFTA award". BBC Online. 3 February 2011. Archived from the original on 4 February 2011. Retrieved 3 February 2011. ^ "Outstanding British Contribution to Cinema in 2011 – The Harry Potter films". British Academy of Film and Television Arts (BAFTA). 3 February 2011. Archived from the original on 6 February 2011. Retrieved 3 February 2011. ^ "BAFTA Honors John Lasseter and David Yates 11/30". Broadway Worldwide (Los Angeles). 28 June 2011. Archived from the original on 20 January 2012. Retrieved 28 June 2011. The worldwide success of Mr. Lasseter for Walt Disney and Pixar Animation Studios and Mr. Yates' contribution to the final four parts of the 'Harry Potter' franchise makes them global wizards in their own right, and are delighted to honor these remarkable filmmakers with this year's Britannia Award. ^ "John Lasseter and David Yates set to be honored by BAFTA Los Angeles". Los Angeles Times. 28 June 2011. Archived from the original on 3 July 2011. Retrieved 28 June 2011. ^ a b c d e f g "Film in 2002". British Academy of Film and Television Arts (BAFTA). Archived from the original on 4 November 2014. Retrieved 5 July 2017. ^ a b c "Film in 2003". British Academy of Film and Television Arts (BAFTA). Archived from the original on 4 May 2016. Retrieved 5 July 2017. ^ a b c d "Film in 2005". British Academy of Film and Television Arts (BAFTA). Archived from the original on 28 May 2016. Retrieved 5 July 2017. ^ a b c "Film in 2006". British Academy of Film and Television Arts (BAFTA). Archived from the original on 5 March 2016. Retrieved 5 July 2017. ^ a b "Film in 2008". British Academy of Film and Television Arts (BAFTA). Archived from the original on 17 April 2017. Retrieved 5 July 2017. ^ a b "Film in 2010". British Academy of Film and Television Arts (BAFTA). Archived from the original on 4 May 2016. Retrieved 5 July 2017. ^ a b "Film in 2011". British Academy of Film and Television Arts (BAFTA). Archived from the original on 4 May 2016. Retrieved 5 July 2017. ^ a b c d "Film in 2012". British Academy of Film and Television Arts (BAFTA). Archived from the original on 5 March 2016. Retrieved 5 July 2017. ^ a b c d e "Film in 2017". British Academy of Film and Television Arts (BAFTA). Archived from the original on 15 June 2017. Retrieved 5 July 2017. ^ a b "Bafta Film Awards 2019: All the nominees". BBC News. 9 January 2019. Retrieved 9 January 2019. ^ a b c d "John Williams". The Recording Academy. Retrieved 5 July 2017. ^ "Nicholas Hooper". The Recording Academy. Retrieved 5 July 2017. ^ "Alexandre Desplat". The Recording Academy. Retrieved 5 July 2017. ^ Geier, Thom (6 March 2017). "'Harry Potter and the Cursed Child' Breaks Olivier Awards Record With 11 Nominations". TheWrap. Archived from the original on 5 May 2017. Retrieved 12 July 2017. ^ Bano, Tim (9 April 2017). "Olivier Awards 2017: Harry Potter and the Cursed Child wins record nine prizes". The Stage. Archived from the original on 15 April 2017. Retrieved 12 July 2017. ^ Cox, Gordon (1 May 2018). "Tony Nominations 2018: 'Mean Girls,' 'SpongeBob' Score Big (Complete List)". Variety. Archived from the original on 2 May 2018. Retrieved 2 May 2018. ^ Nyren, Erin (10 June 2018). "Tony Award Winners 2018: The Complete List". Variety. Archived from the original on 11 June 2018. Retrieved 11 June 2018. ^ "Waiting for Pottermore?". Pottermore. 8 March 2012. Archived from the original on 10 March 2012. Retrieved 9 March 2012. ^ "Pottermore". Pottermore. Archived from the original on 26 September 2015. Retrieved 8 October 2015. ^ "You can finally reclaim your old Hogwarts house and wand on Pottermore — here's how". Business Insider. 28 January 2016. Archived from the original on 17 October 2016. Retrieved 4 July 2017. ^ "Harry Potter theme park planned". BBC News. 31 May 2007. Archived from the original on 12 May 2014. ^ Sturcke, James (31 May 2007). "Harry Potter theme park to open in Florida". The Guardian. Archived from the original on 31 August 2013. Retrieved 19 May 2010. ^ "Harry Potter theme park swoops to Fla". USA Today. 31 May 2007. Archived from the original on 11 October 2008. Retrieved 19 May 2010. ^ Albright, Mark (1 June 2007). "A whole new magic kingdom". The St. Petersburg Times. Retrieved 19 May 2010. ^ "What to expect when the Wizarding World at Universal Studios Hollywood opens in April". Los Angeles Times. Archived from the original on 3 April 2016. Retrieved 3 April 2016. ^ a b Sadlier, Allison (12 August 2016). "J.K. Rowling Wizarding World tie-in books debut covers". Entertainment Weekly. Archived from the original on 21 October 2017. Retrieved 21 July 2017. ^ "J.K. Rowling's Wizarding World: Movie Magic Volume Two: Curious Creatures by Ramin Zahed". Penguin Random House. 14 March 2017. Archived from the original on 21 October 2017. Retrieved 21 October 2017. ^ "J.K. Rowling's Wizarding World: Magical Film Projections: Creatures". Penguin Random House. 4 April 2017. Archived from the original on 21 October 2017. Retrieved 21 October 2017. ^ "J.K. Rowling's Wizarding World: The Dark Arts: A Movie Scrapbook by Jody Revenson". Penguin Random House. 6 June 2017. Archived from the original on 21 October 2017. Retrieved 21 October 2017. ^ "Harry Potter: Magical Film Projections: Patronus Charm by Insight Editions". Penguin Random House. 4 July 2017. Archived from the original on 21 October 2017. Retrieved 21 October 2017. ^ "J.K. Rowling's Wizarding World: Movie Magic Volume Three: Amazing Artifacts by Bonnie Burton". Penguin Random House. 27 September 2017. Archived from the original on 21 October 2017. Retrieved 21 October 2017. ^ "LEGO Creator: Harry Potter". Behind The Voice Actors. 26 October 2001. Archived from the original on 21 October 2017. Retrieved 21 October 2017. ^ a b "LEGO Creator: Harry Potter for Windows (2002)". MobyGames. 1 February 2002. Archived from the original on 21 October 2017. Retrieved 21 October 2017. ^ a b c d e f "Harry Potter and the Sorcerer's Stone". GameSpot. 15 November 2001. Archived from the original on 22 October 2017. Retrieved 22 October 2017. ^ a b "Amazon.com: Harry Potter and the Chamber of Secrets – Mac: Aspyr". Amazon.com. 28 February 2002. Archived from the original on 22 October 2017. Retrieved 22 October 2017. ^ a b c "Harry Potter and the Sorcerer's Stone – GameCube". IGN. 9 December 2003. Archived from the original on 22 October 2017. Retrieved 22 October 2017. ^ a b c d e f "Harry Potter and the Chamber of Secrets". GameSpot. 5 November 2002. Archived from the original on 22 October 2017. Retrieved 22 October 2017. ^ "Harry Potter and the Chamber of Secrets for PlayStation 2". GameFAQs. Retrieved 23 November 2018. ^ "Harry Potter and the Chamber of Secrets for PC". GameFAQs. Retrieved 23 November 2018. ^ a b c "Aspyr Releases `Harry Potter and the Chamber of Secrets' for the Macintosh" (Press release). Aspyr Media. Business Wire. 14 April 2003. Retrieved 23 November 2018. ^ a b "LEGO Creator: Harry Potter and the Chamber of Secrets". IGN. 15 November 2002. Archived from the original on 21 October 2017. Retrieved 21 October 2017. ^ a b "Lego Creator: Harry Potter and the Chamber of Secrets – PC – Review". GameZone. 22 January 2003. Archived from the original on 21 October 2017. Retrieved 21 October 2017. ^ a b c "Harry Potter: Quidditch World Cup Videogame International Champion Announced" (Press release). Electronic Arts. Business Wire. 22 December 2003. Retrieved 23 November 2018. ^ "Harry Potter: Quidditch World Cup for PlayStation 2". GameFAQs. Retrieved 23 November 2018. ^ "Harry Potter: Quidditch World Cup for Game Boy Advance". GameFAQs. Retrieved 23 November 2018. ^ a b "Harry Potter and the Prisoner of Azkaban". GameSpot. 25 May 2004. Archived from the original on 22 October 2017. Retrieved 22 October 2017. ^ a b c "Harry Potter and the Prisoner of Azkaban for GameCube (2004)". MobyGames. 2 June 2004. Archived from the original on 22 October 2017. Retrieved 22 October 2017. ^ "Harry Potter and the Prisoner of Azkaban – Game Boy Advance". IGN. 3 June 2004. Archived from the original on 22 October 2017. Retrieved 22 October 2017. ^ a b "Harry Potter: Find Scabbers". IGN. Retrieved 2 November 2018. ^ a b c "Harry Potter and the Goblet of Fire". IGN. 8 November 2005. Archived from the original on 22 October 2017. Retrieved 22 October 2017. ^ "Harry Potter and the Goblet of Fire for DS Reviews". Metacritic. Retrieved 23 November 2018. ^ a b ""HARRY POTTER AND THE ORDER OF THE PHOENIX" ON MOBILE PHONES THIS SUMMER" (Press release). Warner Bros. Entertainment. 5 June 2007. Retrieved 2 December 2018. ^ a b c "Harry Potter and the Order of the Phoenix". IGN. Archived from the original on 22 October 2017. Retrieved 22 October 2017. ^ "Harry Potter and the Order of the Phoenix for DS Reviews". Metacritic. Retrieved 23 November 2018. ^ a b "Harry Potter and the Order of the Phoenix for Game Boy Advance Reviews". Metacritic. Retrieved 23 November 2018. ^ "Harry Potter and the Order of the Phoenix for Macintosh". GameFAQs. Retrieved 23 November 2018. ^ a b "Harry Potter: Mastering Magic". IGN. Retrieved 2 December 2018. ^ a b c "EA and Warner Bros. Interactive Entertainment Confirm Harry Potter and the Half-Blood Prince Video Game Release Date" (Press release). Electronic Arts. Business Wire. 14 May 2009. Archived from the original on 22 October 2017. Retrieved 22 October 2017. ^ Dredge, Stuart (24 April 2008). "Harry Potter and the Half-Blood Prince goes mobile". Pocket Gamer. Retrieved 2 December 2018. ^ a b "Correcting and Replacing Warner Bros. Interactive Entertainment and TT Games Launch LEGO® Harry Potter™: Years 1–4" (Press release). Warner Bros. Interactive Entertainment. Business Wire. 29 June 2010. Archived from the original on 22 October 2017. Retrieved 22 October 2017. ^ a b "LEGO Harry Potter: Years 1-4 for iPhone/iPad Reviews". Metacritic. Retrieved 23 November 2018. ^ "Amazon.com: LEGO Harry Potter: Years 1-4: PC: Video Games". Amazon. 22 February 2011. Retrieved 22 October 2017. ^ "LEGO Harry Potter: Years 1-4 for DS Reviews". Metacritic. Retrieved 23 November 2018. ^ "LEGO Harry Potter: Years 1-4 for PSP Reviews". Metacritic. Retrieved 23 November 2018. ^ a b "LEGO Harry Potter Years 1-4". Mac App Store. Retrieved 23 November 2018. ^ a b "Feral Support - LEGO Harry Potter: Years 1-4". Feral Interactive. Retrieved 23 November 2018. ^ a b c d Davenport, Corbin (27 September 2016). "[You're on Android, Harry] LEGO Harry Potter games now available for Android". Android Police. Retrieved 23 November 2018. ^ a b c d e f Makuch, Eddie (8 September 2016). "Remastered Lego Harry Potter Collection Coming, But Only for PS4". GameSpot. Archived from the original on 22 October 2017. Retrieved 22 October 2017. ^ a b c d e f "Remastered Harry Potter LEGO games for Xbox One and Nintendo Switch are out today". Pottermore. 31 October 2018. Retrieved 12 November 2018. ^ a b c "Harry Potter and the Deathly Hallows – Part 1 Overview". Polygon. 16 November 2010. Archived from the original on 21 October 2017. Retrieved 21 October 2017. ^ a b "Harry Potter and the Deathly Hallows (Part 1)". Full Fat. Retrieved 23 November 2018. ^ Turton, Wayne (18 November 2010). "Harry Potter and the Deathly Hallows Part 1". Pocket Gamer. Retrieved 2 December 2018. ^ a b "Gameloft Games for Mobile Phones". Gameloft. Archived from the original on 5 August 2011. Retrieved 23 November 2018. ^ a b c "Harry Potter and the Deathly Hallows – Part 2 Overview". Polygon. 12 July 2011. Archived from the original on 21 October 2017. Retrieved 21 October 2017. ^ a b "Harry Potter and the Deathly Hallows (Part 2)". Full Fat. Retrieved 23 November 2018. ^ a b c "Warner Bros. Interactive Entertainment and TT Games Launch LEGO® Harry Potter™: Years 5–7" (Press release). Warner Bros. Interactive Entertainment. Business Wire. 11 November 2011. Archived from the original on 22 October 2017. Retrieved 22 October 2017. ^ a b "Lego Harry Potter: Years 5–7 Apparates on to the Mac!". Feral Interactive. 3 March 2012. Archived from the original on 22 October 2017. Retrieved 22 October 2017. ^ "Feral Support - LEGO Harry Potter: Years 5-7". Feral Interactive. Retrieved 23 November 2018. ^ a b Gallagher, Simon (3 May 2012). "LEGO Harry Potter Years 5-7 Available For iPad, iPhone & iPod Touch". WhatCulture. Retrieved 23 November 2018. ^ a b c d "Warner Bros. Interactive Entertainment Announces Fantastic Beasts™: Cases From The Wizarding World for Mobile Devices" (Press release). Warner Bros. Interactive Entertainment. Business Wire. 17 October 2016. Archived from the original on 27 October 2016. Retrieved 14 March 2018. ^ a b Jarvey, Natalie (5 April 2018). "Maggie Smith, Michael Gambon to Reprise Roles for Harry Potter Mobile Game". The Hollywood Reporter. Archived from the original on 6 April 2018. Retrieved 6 April 2018. ^ a b c "Harry Potter for Kinect". GameSpot. 9 June 2012. Archived from the original on 21 October 2017. Retrieved 21 October 2017. ^ "Wonderbook: Book of Spells for PlayStation 3 (2012)". MobyGames. 11 November 2012. Archived from the original on 21 October 2017. Retrieved 21 October 2017. ^ a b Trumbore, Dave (5 June 2012). "J.K. Rowling's Wonderbook: Book of Spells Coming to Your PS3". Collider. Archived from the original on 21 October 2017. Retrieved 21 October 2017. ^ a b c "Wonderbook: Book of Potions". IGN. 12 November 2013. Archived from the original on 21 October 2017. Retrieved 21 October 2017. ^ "First look at new logo for mobile game Harry Potter: Wizards Unite". Pottermore. 14 November 2018. Retrieved 14 November 2018. ^ a b c "NIANTIC, INC. AND WARNER BROS. INTERACTIVE ENTERTAINMENT ANNOUNCE PARTNERSHIP FOR HARRY POTTER: WIZARDS UNITE, AN AUGMENTED REALITY MOBILE GAME INSPIRED BY J.K. ROWLING'S WIZARDING WORLD - Niantic". Niantic. Archived from the original on 10 November 2017. Retrieved 29 June 2018. ^ Robertson, Adi (1 November 2016). "Google's Daydream VR headset is coming November 10th". The Verge. Archived from the original on 21 October 2017. Retrieved 21 October 2017. ^ a b Roettgers, Janko (18 November 2016). "VR Review: 'Fantastic Beasts' Virtual Reality Experience". Variety. Archived from the original on 21 October 2017. Retrieved 21 October 2017. ^ "New expanded Fantastic Beasts and Where to Find Them VR Experience announced". Pottermore. 22 January 2018. Archived from the original on 13 May 2018. Retrieved 13 May 2018.